Old doctor recommend you pills. Smiling old doctor with pills showing thumb up. Smiling doctor recommend you pack of pills. Smiling old doctor with two packs of pills showing thumb up. 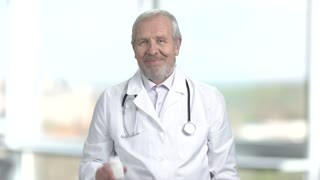 Mature doctor advertising can of pills. Doctor recommending pills showing thumb up, green hroma background. Senior doctor prescribing pills in strip. Old smiling therapist shows thumb up, recommending advicing to take pills in pack. Blurred windows with jalousie background. Elderly smiling doctor showing bottle with pills. Aged caucasian doctor holding container with pills and showing thumb up. Pharmaceutical and medicine concept. Senior doctor holding bottle of pills. 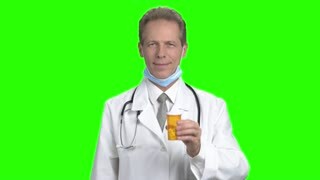 Smiling elderly doctor with pills showing thumb up on blurred background. Symbol of success. 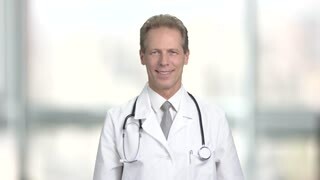 Happy male doctor showing pills. Smiling middle aged doctor with blister of pills showing thumb up gesture. New pharmacy product for effective therapy. Elderly doctor smiling with blister of pills. Happy senior doctor showing pills and gesturing thumb up. Cheerful doctor on window background.